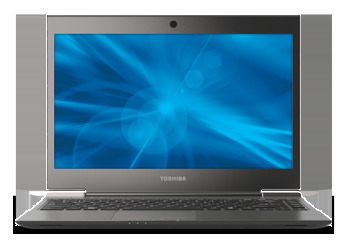 At just 2.4 pounds, the Toshiba Portege Z835 is the lightest of the first wave of Ultrabooks. Most rivals, like the Lenovo IdeaPad U300s and Asus Zenbook UX31E, weigh around 3 pounds. You can immediately feel the difference when you pick up this light-as-a-feather laptop. Unfortunately, this Best Buy exclusive configuration makes a few obvious concessions to reach its attractive $799 (as of November 18, 2011) price. Start with the anemic CPU: The Portege Z835 configuration we tested features a Core i3-2367M running at a paltry 1.4GHz with no Turbo Mode. The system also has 4GB of RAM and a 128GB solid-state drive, though not a particularly fast one. The result in our tests was a disappointing WorldBench 6 score of 79--a lower mark than we’ve seen from any other Ultrabook so far. Forget about modern gaming, as this laptop doesn’t break 30 frames per second even at low resolutions with low quality settings. Toshiba offers other configurations, up to a Core i7-2677M with 6GB of RAM, but that escalates the price to almost $1500, and you still get just a 128GB SSD. Lackluster hardware specs don’t necessarily mean that the system is a pain to use. Even a mediocre SSD is pretty snappy compared with standard rotating hard drives, so boot-up times and resume times from sleep or hibernate mode are nice and fast, and most everyday programs launch quickly. If you’re just interested in some basic Web browsing and document editing, the Portege Z835 is certainly snappy enough. Media playback is another matter. The processor is capable of keeping up with most high-def video playback, though the quality isn’t quite top-notch. A bigger problem is the display, which is subpar. The 1366-by-768-pixel panel is not especially bright, and the apparent contrast is poor. Black levels seem like “really dark gray” at best, and you can immediately notice the problem when viewing dark scenes. The viewing angles from the sides are all right, but the vertical viewing angles are terrible. They're so bad that I couldn’t find a good angle at which to place the screen to deliver even-looking backlighting from top to bottom. Typing and pointing are passable. As with most Ultrabooks, the keyboard has a very short key travel. The keys are also a little squat, having had some of their height lopped off. You’d think this would ruin typing speed and accuracy, but it’s really only a minor drawback. And whereas many Ultrabooks have put a backlit keyboard on the chopping block, the Portege Z835 manages to keep the backlight. The touchpad is smaller than many others, in part because Toshiba gives up some space at the bottom for a pair of physical buttons instead of installing a larger buttonless touchpad. The feel is pretty good, though not nearly as smooth as the glass-coated touchpads on the first Lenovo and Asus Ultrabooks. The expected multitouch gestures, such as pinch-to-zoom and two-finger scrolling, are supported, though they aren’t all enabled by default. The Portege Z835 has a really classy look to it, and that’s not something we often say about Toshiba’s laptops. The muted gray exterior carries over to the inside, with subtle brushing on the magnesium-alloy body. Unfortunately, it doesn’t feel quite as sturdy as you’d hope. The deck feels solid, and the laptop holds up well when closed, but the lid and screen bend quite a bit under even modest pressure. I’m rather impressed by the collection of ports and connectors on this Ultrabook. All Ultrabooks are space-constrained, but Toshiba manages to fit separate headphone and microphone jacks on the left along with an SDHC card slot. Along the back edge, you’ll find the power plug, VGA, HDMI, two USB 2.0 ports, and gigabit ethernet. The right side houses a single USB 3.0 port and a Kensington lock slot. This is as nice an array of full-size ports as we’ve seen on an Ultrabook. A couple other nice features are worth mentioning. An “Eco Mode” button near the power button reduces power consumption by dimming the display, turning off the keyboard backlight, and switching to a more conservative power profile. Next to that is a button to activate remote screen projection via Intel’s WiDi, which is built in. Unfortunately, it seems system makers don’t get to a reasonable price these days without bundling some truly annoying software. Since this machine is a Best Buy exclusive, you’ll find an obnoxious Best Buy PC App, which is just a way to sell you more stuff from Best Buy. You’ll also have to deal with the Norton Internet Security trial nagging you about how your PC is unprotected. A Toshiba Book Place app--which appears to be Blio with a Toshiba skin on it--is also installed, along with the Google Chrome browser. The browser we can deal with, but there’s no good reason for the system to include both Norton and Google browser toolbars; that’s about two toolbars too many. Fortunately, most of this bundle-ware is unobtrusive; I’ve certainly seen systems with a lot more junk on them. The $799 Best Buy version of the Toshiba Portege Z835 is an interesting proposition. It’s noticeably lighter than other Ultrabooks and the MacBook Air, it features a surprisingly good array of ports and a backlit keyboard, and it doesn’t skimp out on the SSD the way the similarly priced Acer Aspire S3 does. On the other hand, the performance of the Core i3 processor isn’t up to the level of its contemporaries, the display quality is mediocre, and the screen has a bit too much flex--an annoying flaw on an otherwise rigid machine. This is certainly an easier laptop to recommend than the Acer Ultrabook (the other sub-$1000 option), but it isn't quite as likable as the Asus Zenbook UX31E or Lenovo IdeaPad U300s. This may be the best Ultrabook you can buy for under $1000 right now, but it's clear where Toshiba made concessions to drop the price.